Last night, Ken, Noy and I went to the airport to welcome, around 11:30 pm, our special Canadian guests, John Loewen and his 15-year-old son Samuel. We were very happy to meet each other. They had a long flight from Seoul. As expected, they were quite tired and so glad to go to bed. This Friday, we had another busy and productive day. After a good breakfast at the Banneton, we left to go to the printer to pick up some banners. 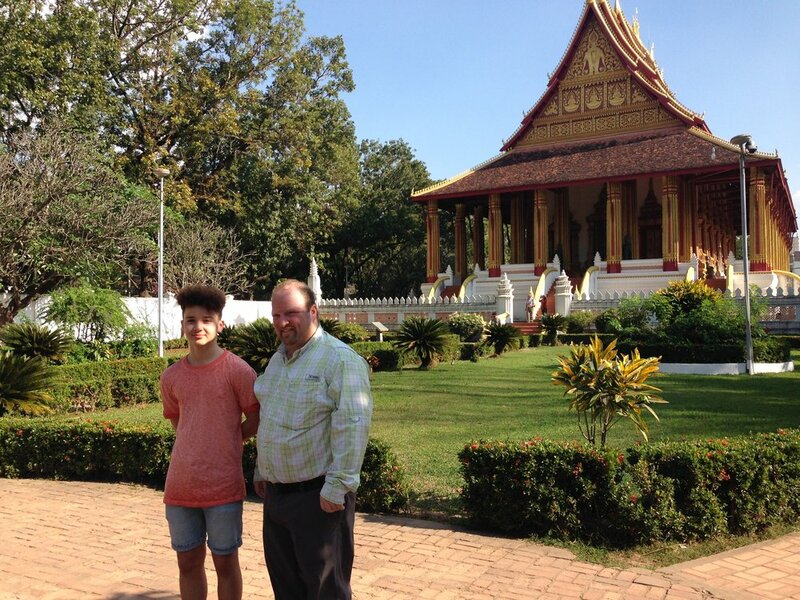 John and Sam had their first experience on a tuk-tuk or jumbo. Then at 11 am, we had a great meeting with Tim Edwards, Chargé d’affaires and Head of Office, at the Office of the Embassy of Canada. Mr. Edwards gave us a lot of information and answered to many of our questions. We really hope to work together in a near future and for sure stay in touch. At noon, it was time for lunch. 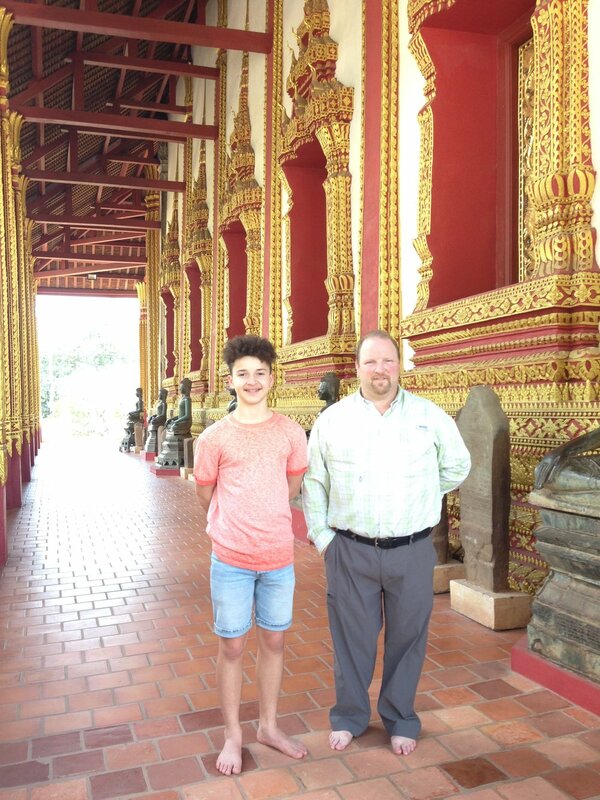 John and Sam had their first local pho soup – among the best according to Sam. 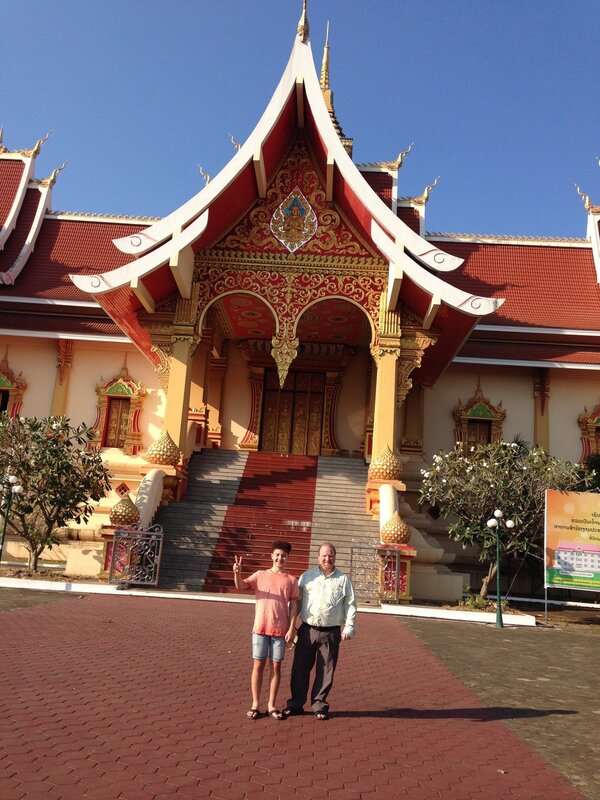 Then we went to the shop Les Artisans Lao. John and Sam bought some nice gifts and souvenirs. 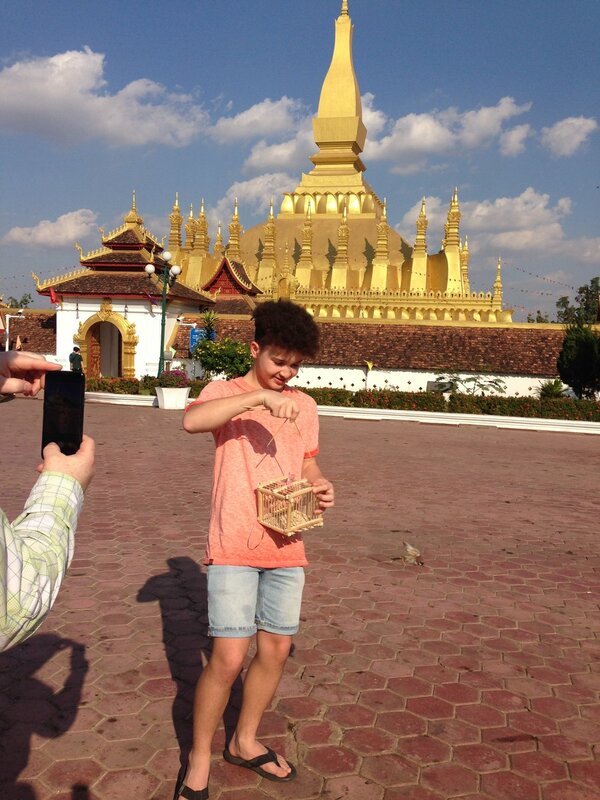 After that we visited famous traditional local places: Wat Sisaket Museum, Wat Ho Phra Keo Museum, That Luang stupa where Sam gave freedom to a couple of birds in exchange for some wishes. 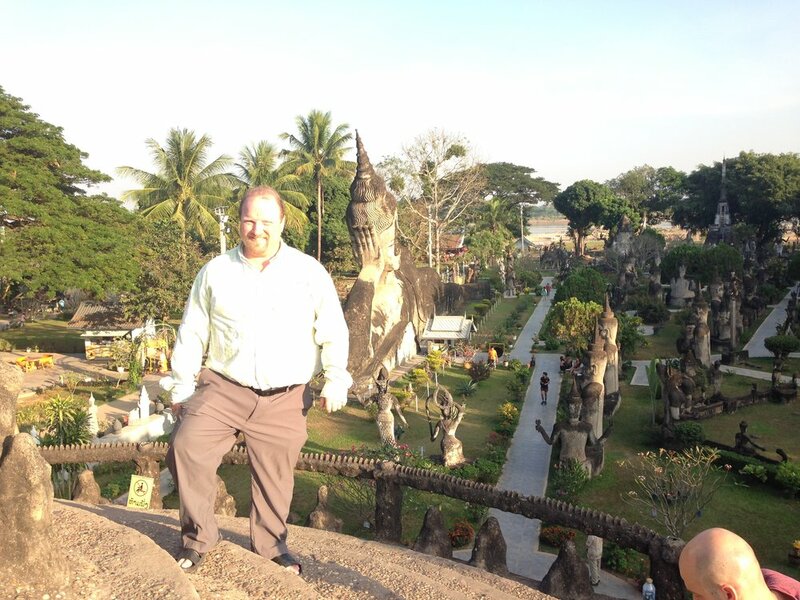 Then we went to Xiengkhouane Buddha Park. 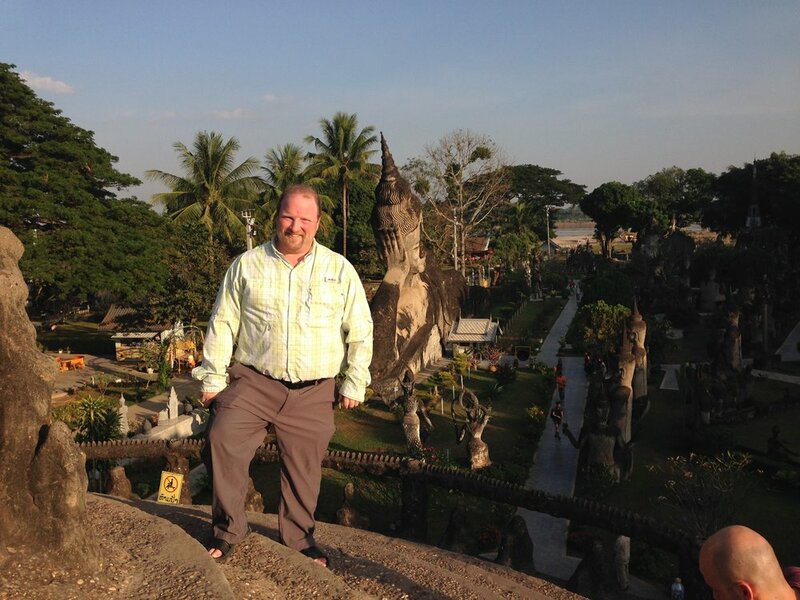 The impressive leaning Buddha statue and the Heaven & Hell pumpkin are always fun to contemplate. We had a tasty coconut ice cream before going, around 6 pm, to a terrace area by the Mekong admire the ending of the sunset, and get refreshments at the Smile Dee restaurant. At 7 pm, it was supper time. At the Suntara restaurant, on the third floor terrace with a view over the Mekong, we had plenty of good food: spring rolls, grilled sirloin, sticky rice, spicy shrimp soup, turkey laab. Back on a tuk-tuk, we headed back to the hotel. 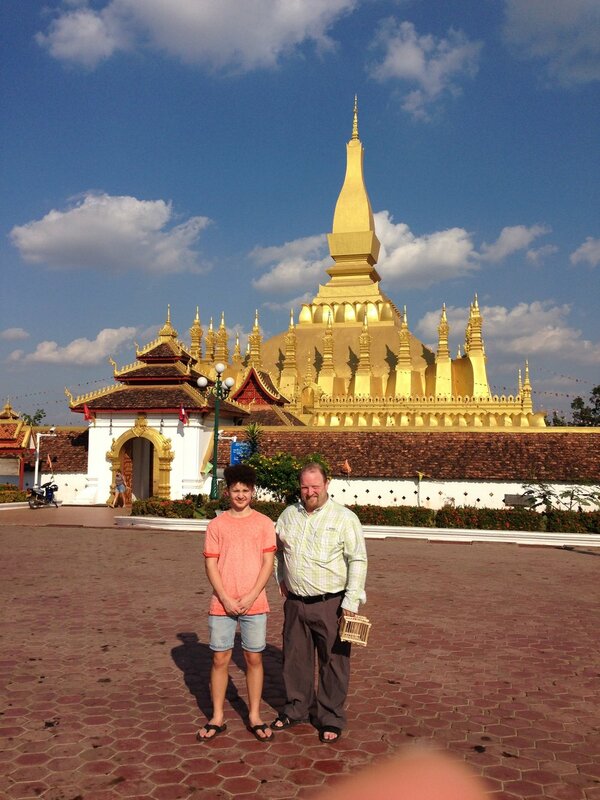 John and Sam enjoyed greatly their first day in Vientiane, Laos. A lot to see, to learn and to appreciate. Time to rest and sleep well to recover in preparation for our departure to Vang Vieng tomorrow.